Delia was born in southern Georgia, and grew up riding horses in the woods around Thomasville. Her mother, also an outside-girl, encouraged Delia to explore far into the oak forests, saying “Go way out yonder where the crawdads sing.” Her mother taught her how to hike without stepping on rattle snakes, and most important not to be afraid of critters of any kind. Delia went on to spend most of her life in or near true wilderness, and since childhood has thought of Nature as a true companion. One of her best friends. 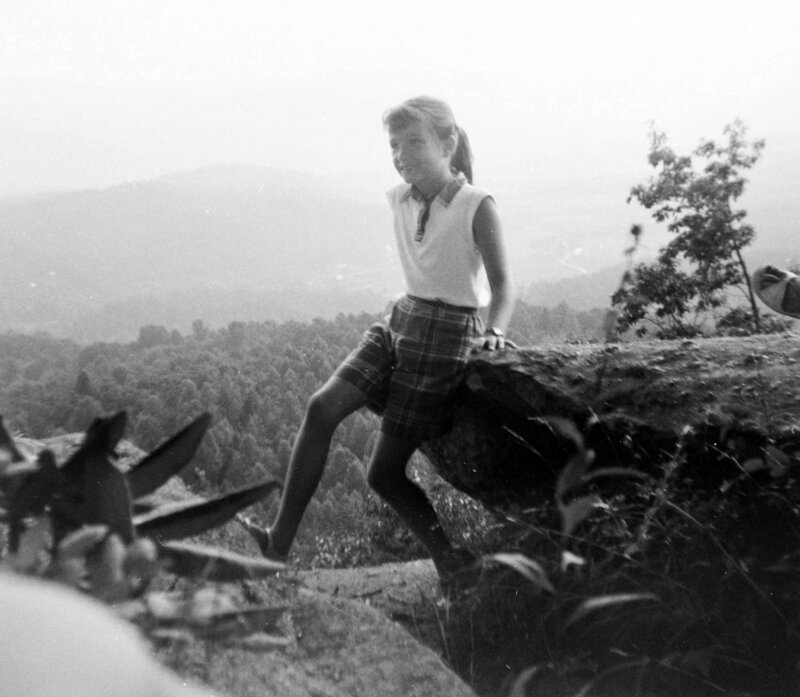 Delia enjoys a mountain top in North Carolina during a family vacation in 1960. In an old, rattle-trap Land Rover, Delia and Mark Owens drove overland into the Central Kalahari of Botswana in early 1974. They set up a basic campsite in an area so remote they were the only two people, except for a few bands of roving Bushmen, in an area the size of Ireland. Very soon the first pride of lions moseyed up to Delia and Mark’s camp, and lay just beyond the trees. The Owens radio collared and studied six lion prides for more than seven years. The Blue Pride's territory included the Owens' camp, and Sassy, Chary, and Blue often romped near the Owens' tents or ransacked the outdoor kitchen. Delia and Mark also studied the elusive brown hyenas, who came into camp almost every night. During these years, Delia became fascinated with the social groups of mammals which are almost always made up of females. The males come and go for mating or meals, but the females stay in their birth groups and maintain strong bonds with their pride or pack mates for life. These observations reminded Delia of the close bonds she had with her life-time girl friends, and how strong the genetic propensity for female groups must be in our own species. Based on their research and life in the Kalahari, she co-authored the bestselling, award-winning book, Cry of the Kalahari. Her research on the evolution of social denning in brown hyenas earned her a Ph. D. at the University of California, Davis. Delia and Mark lived in a very basic tented camp for more than seven years while studying Kalahari lions, brown hyenas and leopards. Photo: Mark J. Owens. Delia prepares to put a radio collar on The Pink Panther, a Kalahari leopard. 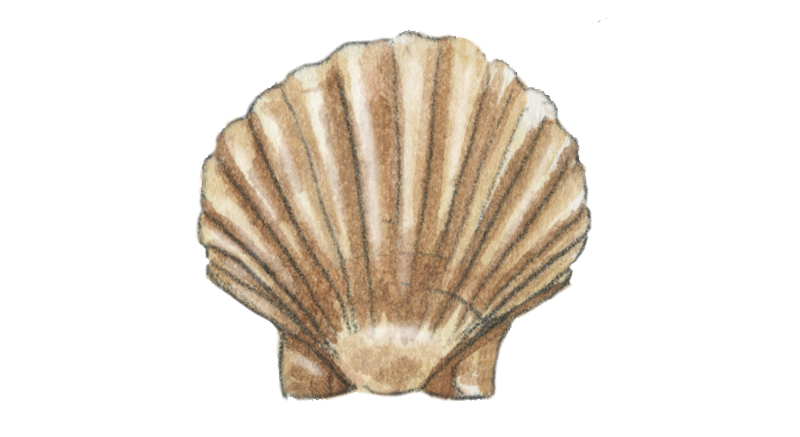 He often came into their camp, and once slept on the ground-sheet outside their tent door. Photo: Mark J. Owens. When Pepper, the brown hyena cub, first left the den, she came straight to the Owens camp and stepped into the bath hut with Delia. Photo: Mark J. Owens. From the Kalahari, the Owens ventured to the North Luangwa Valley of Zambia to continue wildlife research. Besides studying elephants, Delia and Mark established a program that offered jobs, loans, and other assistance to local villagers so they would not have to poach wildlife for a living. Soon the elephants felt safe in the Owens’ camp and would stroll between their cottages feeding on marula fruits. An orphaned elephant, the Owens named Gift, wandered into their camp one day and took up residence among the bungalows. Several years later she had her first calf, Georgia, and eventually a grand-calf. Once again Delia was fascinated by the fact that the herds were made up only of closely bonded females and their offspring. Delia set up her own camp on the banks of the Luangwa River, and studied the social behavior of the elephants. Every year, she hiked the five major rivers of North Luangwa, observing the herds. In all, Delia conducted research on endangered species in Africa for twenty-three years. She published her research results in the scientific journals Nature, Animal Behavior, Journal of Mammalogy, Natural History, and others. Her research and conservation work in Africa earned her the Golden Ark award from Prince Bernhard of the Netherlands and the University of California Award for Excellence. The project they began in Zambia continues to this day, funded in part by the Owens Foundation for Wildlife Conservation. Delia's research on the importance of female grouping in social mammals influenced her fictional writing. Where the Crawdads Sing explores the behavioral impact on a young woman who is forced to live much of her young life without a group. Delia overlooks the Luangwa Valley in Zambia where she studied elephants for eleven years. Photo: Mark J. Owens. Delia lived in her own camp of grass huts on the Luangwa River. From here she followed elephant herds on foot along all the major rivers of the escarpment. Photo: Mark J. Owens. The orphaned elephant, Gift, took up residence in camp, and started a herd of her own with her first calf, Georgia. Photo: Mark J. Owens. After more than two decades in Africa, Delia and Mark returned to the United States and searched for a wild place with lots of wildlife to be their new home. They contributed their experience, time and resources to the conservation of grizzly bears, wolves and wetlands. 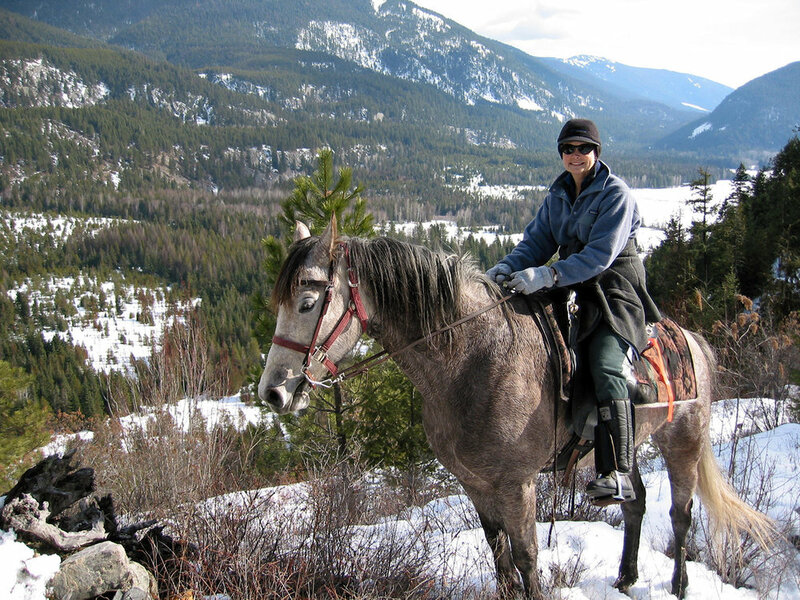 Delia now lives in Idaho where she rides her horse and back-country skies as far into the wilderness as she can go. Elk, bears, moose and deer wander the meadows near her home, but every day she thinks of the elephants Gift and Georgia, the Blue Pride of lions and the Bemba people she knew so closely in Africa for so long. She wants to continue writing fiction, especially mysteries that explore how our evolutionary past on the savannas influenced our current behavior in a world less wild. 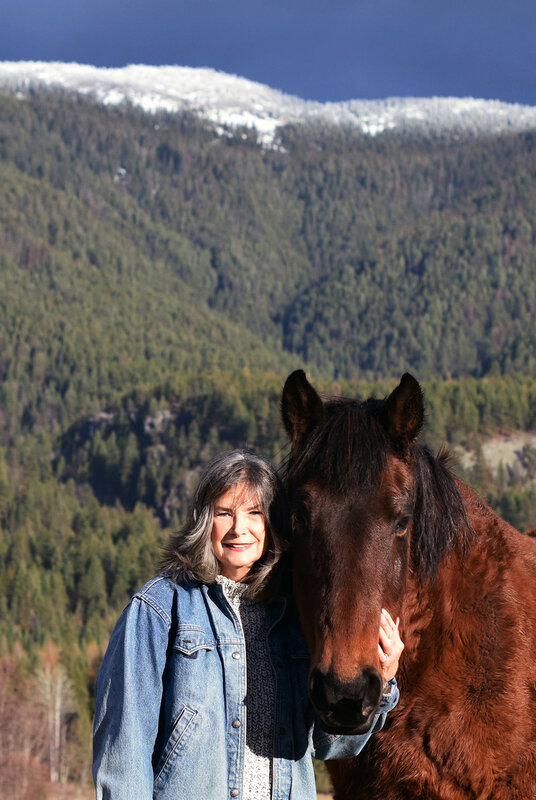 Delia rides her beloved mare, Stormy Girl, in the mountains overlooking her home in Idaho. Mark J. Owens. Delia on her ranch in Idaho. Photo: Mark J. Owens.